The first task is as simple as it is hard: You have one hour to do your shopping in Barcelona - what to buy? Second task might be harder: Where to buy it? In my case, I knew very well that what I wanted - needed! - was Spanish ham! It keeps well, both during transportation and on return, and unless one goes for a full leg, goes neatly into your suitcase. But best of all, months after your return, you will be able to bring back memories of happy days under the Spanish sun, slice by thin slice. So the first choice was easy, really, but for one who does not know Barcelona very well, the second could very well been quite a challenge. Luckily, your hotel can usually help, although I had to enquire twice, as "it was really the manager who knew good ham". Indeed he did, and after a nice chat, I had a the words "Reserva Iberica", a magic circle on my tourist map, and went rambling up La Rambla with my suitcase on wheels in hunt for ham. A few blocks later I turned left and walked straight into the Reserva Iberica show room and tasting area, pure Ham Heaven. Not so much an average butcher, it was more resembling a modern cafe, with Iberian hams lining the interior, and a seating area in the end. 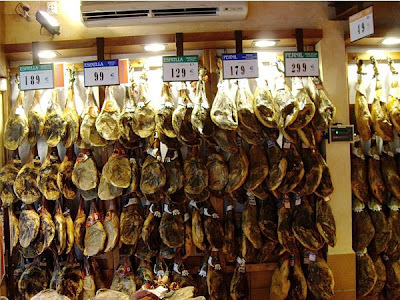 One could also get other Spanish delicacies, such as cheese and special selections of wine going well with the ham. The staff was very pleasant, informative, and English speaking. The show room can be found in Carrer d'Aragó, 242 in Barcelona. I highly recommend the place and their website for more information on Iberian ham at http://www.reservaiberica.com/, which also includes prices. If your country is available for shipping, one can even order ham directly from the website.